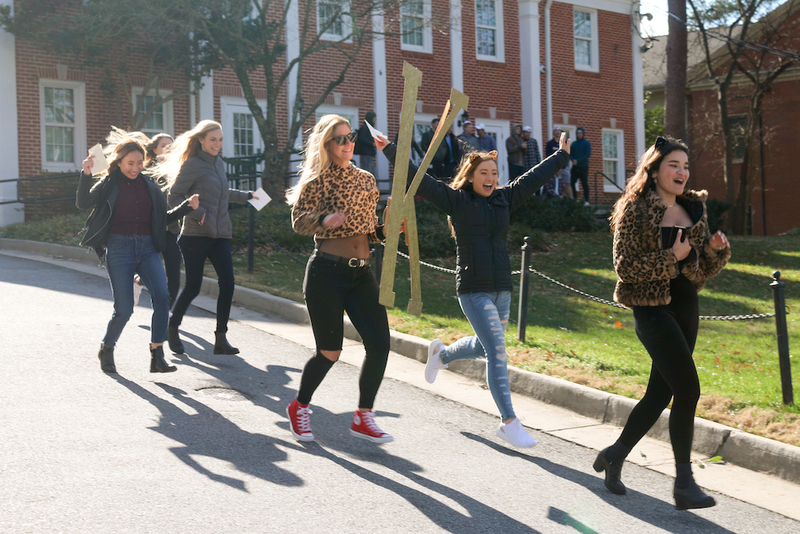 After a five-day recruitment process, 274 women opened their sorority bid cards together on McDonough Field on Sunday to discover which sorority had selected them as members. This year’s recruitment process looked different than years past: potential new members (PNMs) opened their bid cards collectively and started recruitment before the first day of classes. Previously, PNMs opened their bid cards privately in their dorm rooms. Mishalle Marszalek, coordinator of the Office of Sorority and Fraternity Life and Emory Panhellenic Council (EPC) adviser, said EPC implemented a centralized bid day where PNMs open their bid cards together in alignment with guidelines from the National Panhellenic Conference (NPC) and student feedback. Giovanna Gallardo (22C) said she preferred the change to a centralized bid day, but acknowledged that it may have negatively impacted some girls. “Maybe you didn’t get your first choice and you would have wanted it to be in the privacy of your own dorm,” Gallardo said. Dayra Leal Sanchez (22C) said the change to bid cards made the process more enjoyable. Sanchez and Gallardo said they both received bids from their first-choice sorority, Delta Phi Epsilon. Marszalek said the changes were made to emphasize equality across sorority chapters and to increase sorority yield, noting that for the first time in four years, all women who received bids accepted them. Marszalek declined to provide an exact number of women who participated in recruitment this year. The number of women who accepted bids has declined from 2015, when 501 women participated in recruitment this year and 374 received bids. EPC moved sorority recruitment earlier to the weekend of Jan. 12 to prevent the recruitment process from interfering with PNMs’ schoolwork, Marszalek said. However, the new date conflicted with Emory-sponsored events, including the Emory Scholars Program’s and the Goizueta Business School’s retreats. Sanchez, an Emory scholar, said she missed the first two days of recruitment, including convocation, because of the scholars retreat. Marszalek said EPC sent a letter on behalf of all Emory scholars explaining the situation. Sanchez said she was disappointed that she missed the first two days of recruitment but acknowledged that the letter was the best course of action given the situation. Gallardo, who did not have a scheduling conflict with the new date, said she supported EPC’s decision to move recruitment to before classes start. Both Sanchez and Gallardo contradicted Marszalek and said potential recruits were not given the opportunity to give feedback on their availabilities prior to the change.